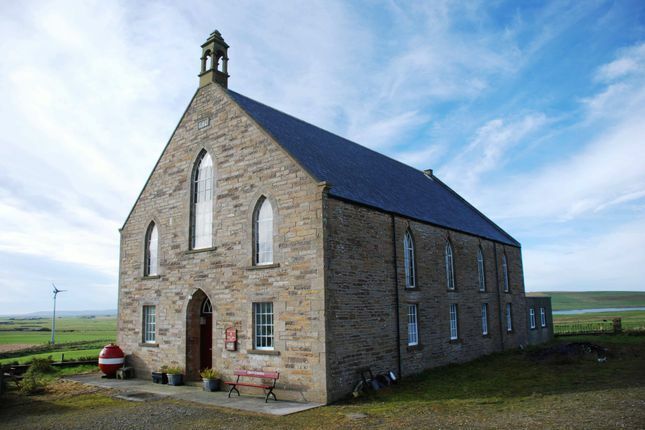 Twatt Kirk is a substantial building in an idyllic rural location with unrestricted views over the west mainland and towards the Hoy hills. Built in 1874, the property remains virtually unchanged and still contains the original wooden pews and pulpit. The annexe provides living accommodation containing kitchen, open plan living/dining room with bedroom area, WC and bathroom. In 2014, the Kirk was re-slated with welsh slate and the flat roof to the annexe was re-felted. The roof cavity was also insulated at this time. The village of Dounby and all local amenities, including supermarket, butcher, pharmacy and primary school, is less than a 10 minute drive away. This commanding building offers tremendous development potential. Viewing is highly recommended. The site extends to approximately 0.45 acres and is shown outlined in red on the plan. EPC Band G (16). Home Report available by email on request.